Iron is an essential mineral. Not only is it used by red blood cells to transport oxygen throughout the body, but it also regulates cell growth, immune function, energy metabolism and cognitive development. Most people get enough iron in their diets, since it's predominantly found in meats, legumes and breakfast cereals, which are enriched with this mineral. Even some fruits and vegetables, such as watermelon and spinach, provide decent amounts of iron. The amount of iron in spinach depends largely on its preparation. 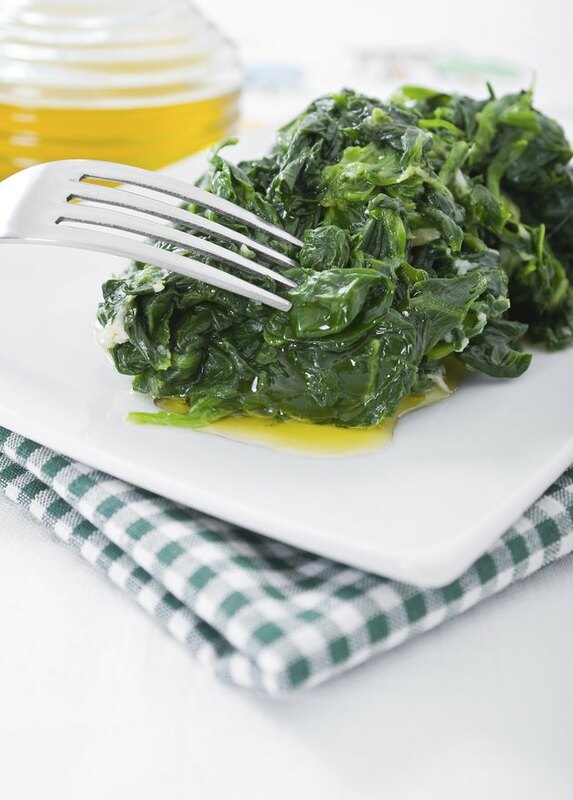 Cooked spinach, for example, provides anywhere between 4.5 and 7 milligrams of iron per ½-cup serving, whereas boiled spinach contains roughly 3.2 milligrams. Canned spinach, on the other hand, provides even less, coming in at 2.5 milligrams per ½ cup. Frozen spinach contains only 1.9 milligrams of iron per ½-cup serving. Watermelon contains far less iron than spinach does, particularly when comparing serving sizes. One cup of watermelon provides 2 percent of your recommended daily allowance of this mineral. This equates to about 0.4 milligrams. You'd need to eat at least 12 cups of watermelon to get even close to the amount of iron in ½ cup of cooked spinach. Like most nutrients, the recommended daily allowance of iron depends on your age and gender. You need 7 milligrams per day from the ages of 1 to 3, 10 milligrams from 4 to 8 and 8 milligrams from 9 to 13. At the age of 14, iron intake reflects your gender. From 14 to 18, males need 11 milligrams and females need 15 milligrams each day. After this, intake drops to 8 milligrams for men and rises to 18 milligrams for women. Once women reach the age of 51, iron needs drop to that of men. Although the iron is watermelon and spinach can be important for your health, it isn't as easily absorbed as iron from meat-based foods. Consuming foods rich in vitamin C in the same meal as watermelon or spinach can help your body use iron in these foods, because the vitamin boosts iron uptake by your cells. Good sources of vitamin C include citrus fruits and juices, strawberries, broccoli, tomatoes and their juice, and cantaloupe.